See why Photo Booth Connected is perfect companion for your photo booth software! Photo Booth Connected is the easiest way for photo booth operators and event photographers to add social media to their existing product offerings. 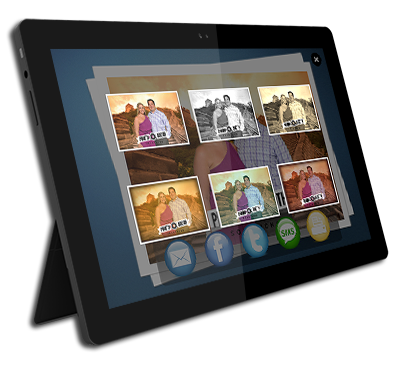 Upload, share and print photos, videos & GIFs from virtually any source. Automatically add logos, overlays and filters. User surveys and data collection. Easily Integrates with BYOBooth for hashtag printing. Runs on PCs, iPads and Android & Windows tablets. 3 platforms - 1 Price. * iOS & Android apps still require a PC running PBC for iOS/Android. Incl. 1 year of updates & installation on 2 PCs. Photo Booth Connected works with "Watch Folders." It doesn't take photos, but instead imports them from other sources, making it a perfect companion for your existing photo booth software. Even if your photo booth has social media capabilities, Photo Booth Connected can help keep the lines moving by giving guests an opportunity to login and share their photos away from the booth on another kiosk photo booth. If you rather do everything on one machine, Photo Booth Connected can also work with your existing photo booth software as a plugin to add social media right at the booth. 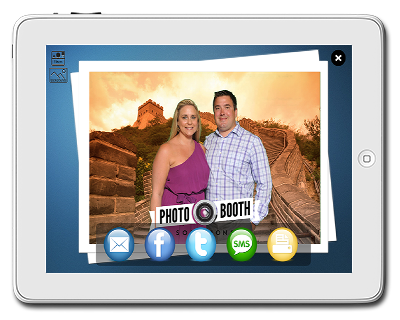 Event photographers can also use Photo Booth Connected app for iPad, Windows, or Android to add onsite printing and social media uploads to their events. 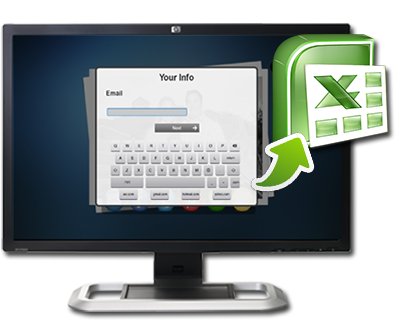 Just use an Eye-Fi card, a tethered camera, or plain ol’ copy & paste to add photos to the kiosk. Photo Booth Connected can also automatically add logos and watermarks, create filters like B&W, sepia & vintage and handle green screen/chroma key removal. Learn more about our photo booth for Event Photographer Branding. Photo Booth Connected gives you plenty of platform choices. All-In-One Touchscreen PCs, Windows Laptops, Win8 tablets*, iPads** and Android tablets** can all be used for the client device. Photo booth app for iPad and other tablets are all included for one price. 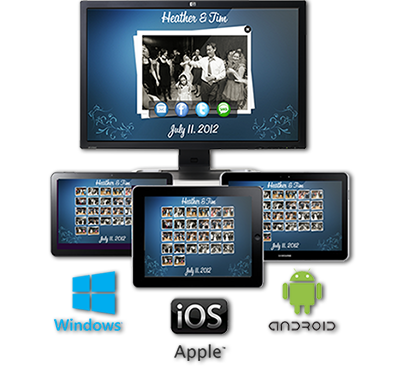 Get our companion Photo Booth App! *WinRT is not supported. Full Windows is required. Atom processors are not recommended. **A PC still is required for the server component for iPad and Android clients. Photo Booth Connected photo booth for Ipads lets users print their photos and also share them via Email, Facebook, Twitter, SMS or Pinterest, right from the kiosk. You can also use background uploaders like Client Facebook, Smugmug and FTP to automate the storage of photos at other locations. Photo Booth Connected also lets users share videos. Learn more about our Social Media Photo Booth. Learn about uploading your photos, videos, and animated GIF's to the cloud with Cloud Storage for Photo Booths. Photo Booth Connected can automatically add overlays to all incoming photos. 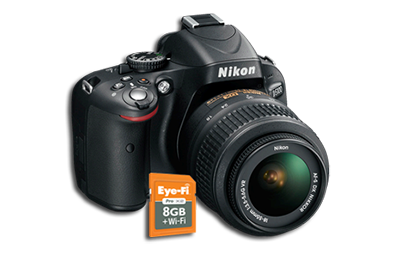 Perfect for event photographers to add logos and client branding to each photo before it is shared on social media. Photo Booth Connected also lets users select different filters for their photos like color, b&w, sepia, and several Instagram inspired vintage filters. Having the ability to promote your brand on a photo from your photo booth app will lead to exposure every time a photo is shared via social media. No need for separate programs. Photo Booth Connected is the only Social Media Kiosk software offering Green Screen removal. Perfect for step and repeat green screen photo shoots, Photo Booth Connected lets guests choose their own backgrounds at separate stations, away from the photographer, so you can keep the line moving and focus on shooting. Use green screen for many different types of Photo Booth Effects. Ask users a series of questions before they are allowed to share their photos. Photo Booth Connected will store this data along with email addresses, Facebook and Twitter usernames, as well as other valuable Facebook user info. 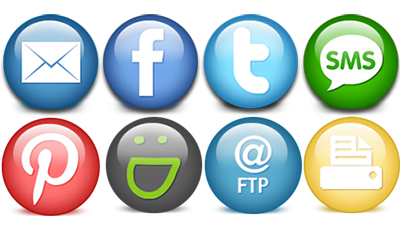 Combined with built in reports for social media usage, this kind of data collection provides an opportunity for your client to get insight into their users and even more value out of the activation. Learn more about Photo Booth Marketing. 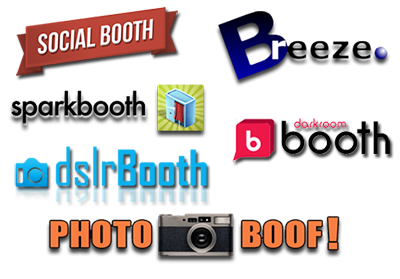 Save $100 on Social Booth! Social Booth & Photo Booth Connected go perfect together. 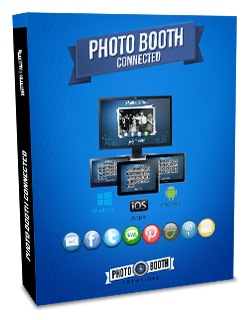 Use Social Booth for your photo booth software and set up Social Media kiosks for your photos with PBC and save $100 when you buy both. *Your $100 coupon will be sent to you with your Photo Booth Connected Pro purchase. PBC doesn't take photos, Social Booth does. Social booth takes photos and uploads to social media. It's a regular photo booth program. PBC doesn't take photos, but is a watch folder based program that allows for social media uploads on separate stations away from the booth on top of other photo booth software at the booth.